Sanity Creek Sock Monkeys | Make monkeys, not war. Bernadette loves taking care of the garden, watching and playing in the rain to see her plants grow. When she wanted to learn piano, she taught herself. The sound of her music is like gentle rain. Since she began playing for her hydrangeas, their color is infinitely more vibrant than without the music. Her favorite color is orange! But purple matters, too: if it’s springtime and you can’t find her, she’s probably playing hide and seek with the hollyhocks or harvesting violets to make her favorite cake. Wait until you taste it! Bernadette, on her way to the Antioch School Auction Gala! What a long and fecund slumber! Soon, soon, the monkeys from Sanity Creek will be waking from their hiatus. Please do stay tuned. 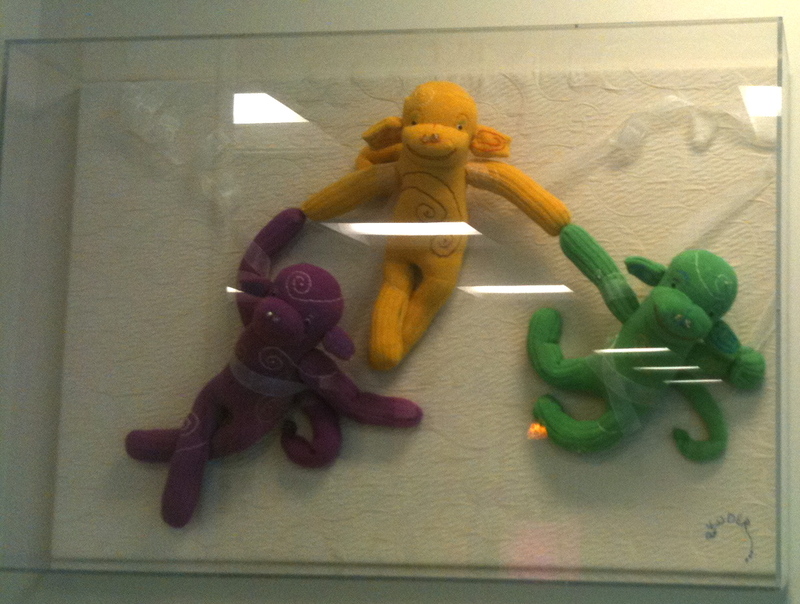 Here is a photo of the monkeys in the Emergency Department at the Childrens’ Medical Center of Dayton. 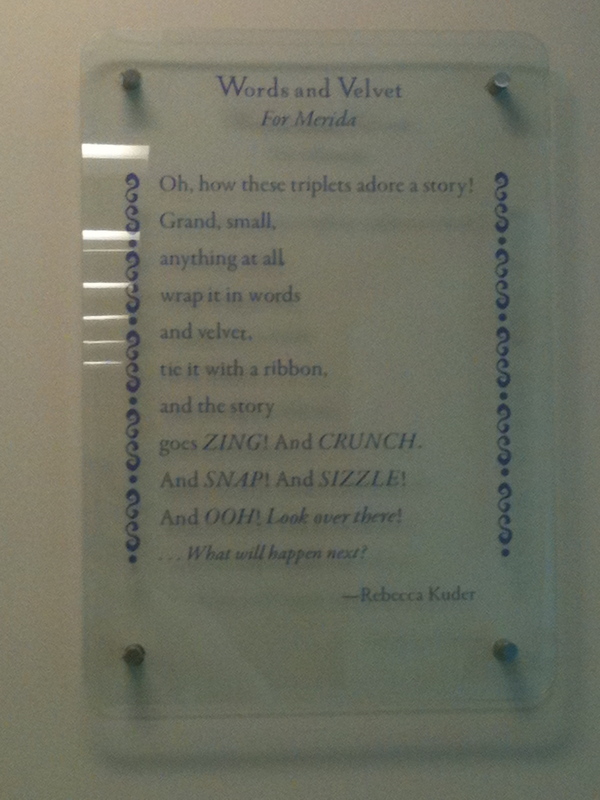 The poem hangs on the wall beside them. Our family recently had cause to visit and be helped by the CMCD and it was so nice to have all the wonderful, kid-friendly art there. And the staff were wonderful. There’s a really nice article here about the partnership between Dayton Children’s Hospital and DVAC. 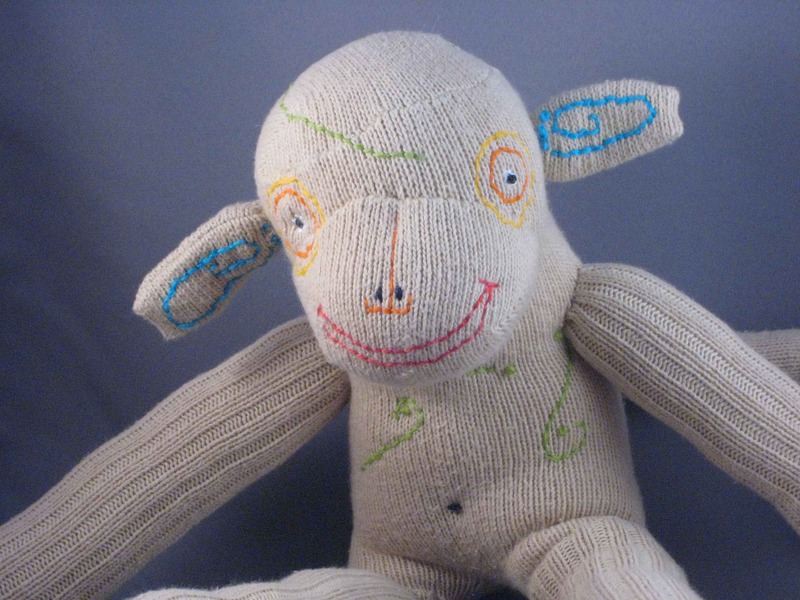 I’m proud to have Sanity Creek Sock Monkeys as part of the project. 🙂 More info on the next phase, and photos, soon. After witnessing the beauty of Leopold’s artistry, never again will the monkeys belittle office work. Without Leopold, we would be lost. Jerzy has made a series of tiny drums. All summer long, he follows the insects, with his timpani mimicking their sounds, stories, songs. He memorizes them. Winters he teaches the younger monkeys the stories, so that Sanity Creek will never lose the mythology of their small compatriots.